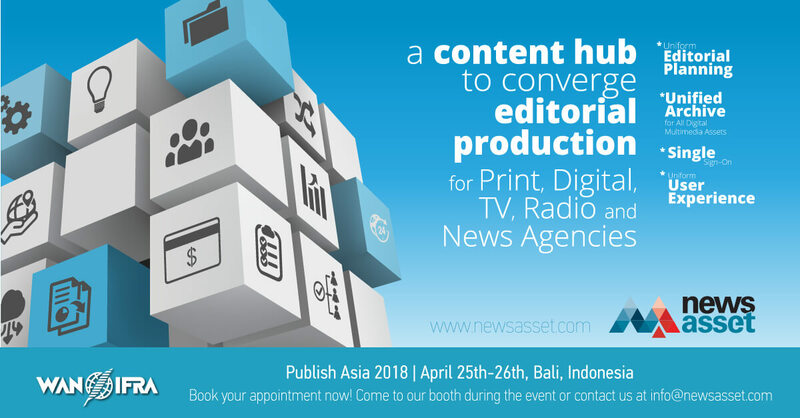 The next few days, newsasset platform will be showcased in Publish Asia 2018, organized by the World Association of Newspapers and News Publishers (WAN-IFRA) in Bali, Indonesia (April 25-26, 2018). At the event, key executives of the Asian media market will have the opportunity to learn about the recent upgrades of the newsasset news management platform, alongside its innovative tools for aggregating and validating user generated content as published and shared in social media. Specifically, newsasset platform now incorporates all the features of the Truly Media service, which has been developed by ATC in collaboration with Deutsche Welle (DW). Truly Media is already being used by Amnesty International in order to verify information related to human rights violations and was also used to tackle fake news issues during the 2017 elections in Germany. Newsasset platform is a cloud based, uniform platform, supporting a common Content Hub and the ability to converge editorial production for Print, Digital, Radio, TV, even News Agency activities; hence, a truly Integrated newsroom can be implemented. For many years now, organizations such as Mediafax (Romania), Media Nea (Dnevne Novine, Montenegro), the greek newspapers “To Vima” and “Ta NEA” , the Helios Kiosk eshop, the Athenian - Macedonian News Agency (AMNA) , along with the ones of Tunisia, Poland and Portugal, entrust newsasset, enjoying a signgle system to cover their production processes end-to-end, while streamlining the enterprise workflows. newsasset platform is an intuitive and secure cloud based environment for storing, managing, creating and publishing news. In order to address the fake news phenomenon, we coupled our extensive industry-related experience with state-of-the-art content aggregation and analysis technology, along with DW’s expertise in contemporary industry need. As a result, they provide Truly Media, a collaborative tool that helps users evaluate the validity level of user generated content that is distributed and shared via various social networks.